Mitral regurgitation is a disorder in which the mitral valve on the left side of the heart does not close properly. Regurgitation means leaking from a valve that does not close all the way. 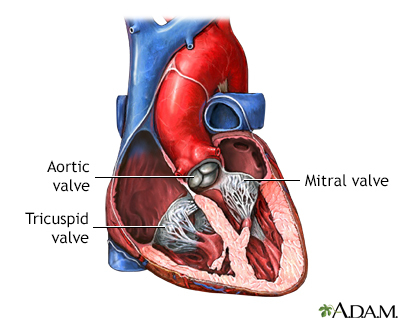 There are four valves in the heart aortic valve, mitral valve, tricuspid valve, and pulmonary valve. 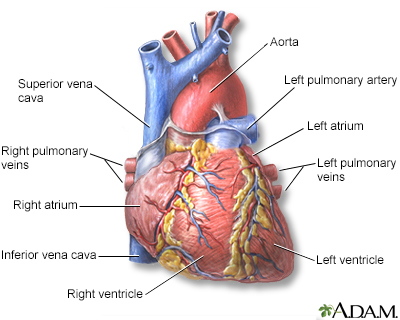 The valves are designed to control the direction of blood flow through the heart. 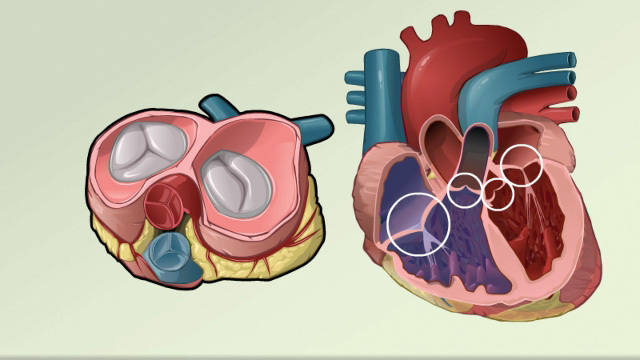 The opening and closing of the heart valves produce the heart-beat sounds. Mitral regurgitation is the most common type of heart valve disorder. Blood that flows between different chambers of your heart must flow through a valve. 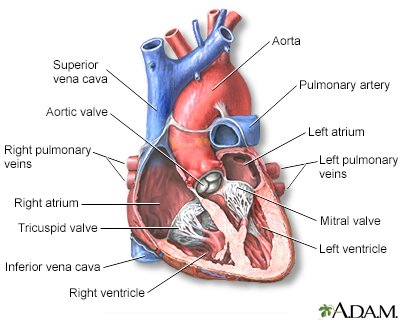 The valve between the 2 chambers on the left side of your heart is called the mitral valve. When the mitral valve doesn't close all the way, blood flows backward into the upper heart chamber (atrium) from the lower chamber as it contracts. This cuts down on the amount of blood that flows to the rest of the body. As a result, the heart may try to pump harder. This may lead to congestive heart failure. Mitral regurgitation may begin suddenly. This often occurs after a heart attack. When the regurgitation does not go away, it becomes long-term (chronic). Rheumatic heart disease. This is a complication of untreated strep throat that is becoming less common. Another important risk factor for mitral regurgitation is past use of a diet pill called "Fen-Phen" (fenfluramine and phentermine) or dexfenfluramine. The drug was removed from the market by the U.S. Food and Drug Administration (FDA) in 1997 because of safety concerns. A heart attack damages the muscles around the mitral valve. The cords that attach the muscle to the valve break. An infection of the valve destroys part of the valve. Cardiac catheterization may be done if heart function becomes worse. Treatment will depend on what symptoms you have, what condition caused the mitral valve regurgitation, how well the heart is working, and if the heart has become enlarged. People with high blood pressure or a weakened heart muscle may be given medicines to reduce the strain on the heart and ease symptoms. A low-sodium diet may be helpful. You may need to limit your activity if symptoms develop. Once the diagnosis is made, you should visit your provider regularly to track your symptoms and heart function. The outcome varies. Most of the time the condition is mild, so no therapy or restriction is needed. Symptoms can most often be controlled with medicine. Call your provider if symptoms get worse or do not improve with treatment. Treat strep infections quickly to prevent rheumatic fever. Always tell your provider and dentist if you have a history of heart valve disease or congenital heart disease before treatment. Some people may need antibiotics before dental procedures or surgery.